LG handed in its report card for Q2 of this year. Overall the company did well, but the mobile phone division continues to struggle. The other divisions picked up the slack though and the company's profit increased compared to the same quarter last year. The Mobile Communications division (which handles phones and network equipment) shipped 13.1 million phones, noting decreasing demand for featurephones and strong sales for LTE-enabled phones. 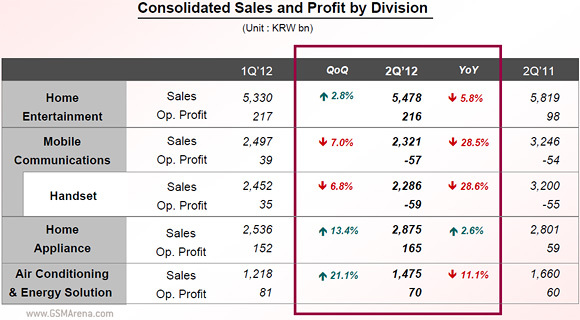 LG sold handsets worth $1.98 billion in Q2, a 28.6% decline year on year and 6.8% decline quarter on quarter. That resulted in an operating loss of $51 million, compared to $48 million loss during Q2 of last year. Part of the operating loss is attributed to increased marketing expenses. LG expects to see even more demand for LTE phones in Q3, but also tougher competition from other companies and their new flagship models. The company plans to continue bringing out new LTE phones in the developed markets and try to improve its marketing and supply chain. The consolidated sales of LG went up to $12.5 billion (up both QoQ and YoY) and the operating profit increased to $303 million (up from $137 million in Q2 2011). Net profit was $138 million. Home Appliances saw improvements in sales and profit both QoQ and YoY, while sales from the other divisions decreased compared to last year. They (aside from the Mobile Communications division) did improve quarter on quarter though. You can find LG's detailed Q2 financial report, including more on how each of its divisions did, over here (PDF). What now?where's the ics update?were not happy to you lg,what phone shall i buy lg tell me samsung,htc etc.tell me lg?